3 Boğaziçi University students have been detained after the police raided their homes and dormitories on Sunday morning, reported Artı Gerçek. The detentions happened the day after Turkey’s President Edoğan vowed on Saturday in Samsun to oust students at one of Turkey’s top universities who held an anti-war protest. Erdoğan called the students ‘communists’ and ‘traitors’ and said they “will not allow them the right to study at this university”. On March 19, pro-government students opened a stand in the Boğaziçi University’s North Campus and started distributing Turkish delights to commemorate 46 soldiers killed during Turkey’s military campaign in Afrin, Syria. A group of anti-war students opened a banner reading “invasion, massacre cannot be celebrated with Turkish delight,” in response and a fight broke out between the two groups. The police detained 3 anti-war protestors the same day. According to Timur Kuran, professor at Duke University, arresting students at Bogazici Campus occurred for the first time in its 155-year history. 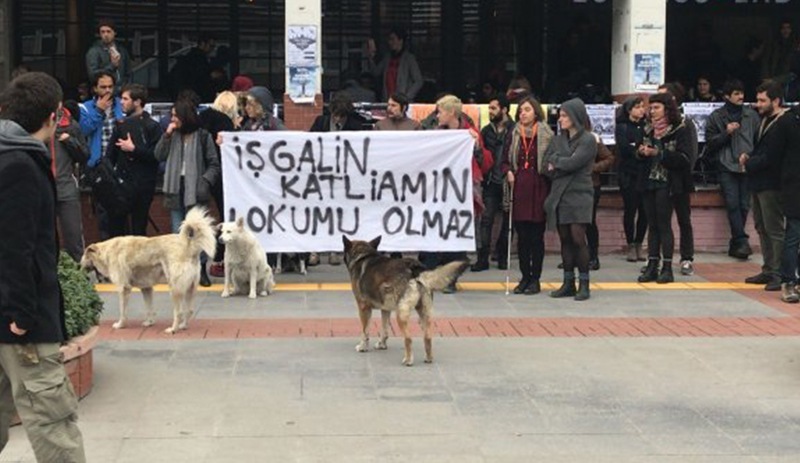 The Youth Branch of the ruling Justice and Development Party (AKP) held a demonstration in the university the next day, holding a large Turkish flag and placards reading “we do not want terrorists at our university” and “greetings to Afrin from Boğaziçi”. The presidency of the Boğaziçi University also published a statement saying they found the attack against the stand “unacceptable like any patriot” and noted that investigations and disciplinary procedures had been launched against students involved. On March 20, 3 additional students were detained and 7 of those who protested the police two days later were detained and released the same day. After the detention of 3 members of the University’s Marxist Thinking Club on Sunday, the number students held under detention since March 19 has increased to 9.